Founded in 1719, Litchfield was designated the county seat in 1751, and by the 1790s the town had become the leading commercial, social, cultural and legal center of Northwestern Connecticut. 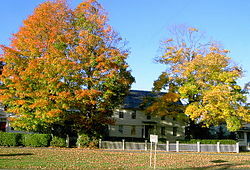 Its population grew from 1,366 in 1756 to 2,544 in 1774, and by 1810 Litchfield was the fourth largest settlement in the state with a population of 4,639. Beginning in 1784, Litchfield lawyer, Tapping Reeve, systematized his law lectures for young students, creating the Litchfield Law School. Reeve was the first to develop a series of formal, regular lectures that insured that all students had access to the same body of knowledge. The list of students who attended Tapping Reeve’s law school includes two Vice Presidents of the United States (Aaron Burr and John C. Calhoun), 101 members of the United States House of Representatives, 28 United States senators, six United States cabinet secretaries, three justices of the United States Supreme Court, 14 state governors and 13 state supreme court chief justices. Litchfield Law School was the first Law School in the United States.